Welcome to Harris Auto Group! The Harris name has been a mainstay in British Columbia’s Nanaimo region for six decades and counting. The Harris Auto Group’s story begins when Tom Harris’ namesake grandfather, Thomas Harris, and Tom’s father, Jack Harris, moved from Nanaimo to Victoria. The coal industry, in which previous Harris generations had made their living, had all but dried up in Nanaimo; the mines were shutting down and work was scarce. The Second World War was approaching and the shipyards in Victoria were busy building warships in anticipation. By the age of 20, Jack had already apprenticed in Nanaimo for Frank Beban, a logging contractor and local businessman, and had earned his machinist ticket. Considering his skill-set, and the lack of suitable work in Nanaimo, Jack sought an opportunity in the shipyards in Victoria in 1938. Jack’s father, a qualified engineer, followed suit in 1939. Upon turning 21, Jack enlisted in the Royal Canadian Navy and commenced service in the engine rooms of the very ships he and his father had helped to build. Toward the end of the war, Jack’s father died after a battle with leukemia; Jack was left to support his Mom, three sisters and the family he and his wife Evelyn were starting. Jack took whatever jobs he could get during the subsequent years. He left a night-shift mill job in Youbou the year his second son, Tom, was born and moved the family back to Victoria. That year he drove a city bus, the bus to Butchart Gardens, and sold pots and pans in the evenings and on weekends. Car dealerships had virtually no inventory to sell during this time due to post-war manufacturing supply backlogs. 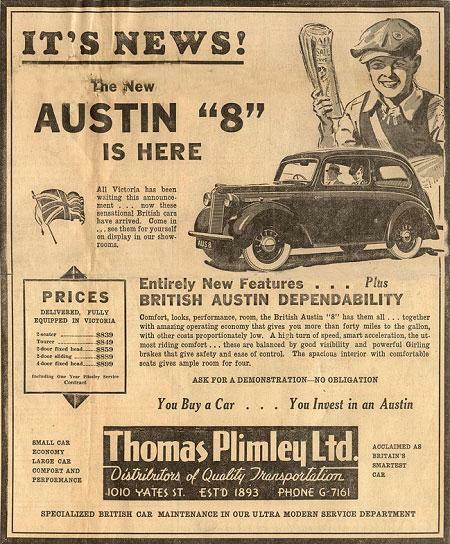 However, when Thomas Plimley Ltd., a Victoria car dealership, began getting stock again, Jack applied to be a car salesman; Evelyn says, ”with his experience and skill he could build cars so he felt certain that he would make a good car salesman.” Jack was 30 years old when he got the job at Plimley’s (now a Moxie’s Grill) selling Austin, Jaguar and Packard automobiles; he made an excellent car salesman indeed. Eventually Jack took a position at the Pontiac Buick GMC dealership in Victoria and then the Chevrolet dealership in Victoria. In 1961, Jack became General Manager of the Ford Dealership in Victoria. When ownership changed hands in 1964, Jack decided it was time to strike out on his own. That same year, Jack partnered with a friend to pool $8,000 of their own money to buy the Rambler dealership in Nanaimo, on Terminal Avenue located across the road from where the Coyote Cafe sits today. For Jack this meant “coming home” as a third-generation Nanaimoite. For Tom, a high school student at the time, the move was not quite so easy. However, being a gregarious young man, Tom soon settled in and found Nanaimo a great place to live. In 1965, the partnership dissolved, so Jack, the more involved partner, became the sole owner/operator of the Rambler dealership, and the store became Harris Rambler. In 1967, a new facility was built in what was then Nanaimo’s “North End;” construction of the new building began on an old chicken farm at the corner of Bowen Road and the Old Island Highway. The facility was earmarked to become a full-line Rambler Jeep Triumph dealership. However, before the building was completed, Jack had the opportunity to take on either the Mercury franchise or the Chevrolet, Oldsmobile & Cadillac franchises. Jack felt the Chevrolet Oldsmobile Cadillac opportunity was more exciting than the Rambler Jeep Triumph opportunity, and so the switch was made. In 1967, Jack Harris Chevrolet Oldsmobile Cadillac sold its first car in the sparkling new store. Tom entered the family business as a “lot boy;” he would work at the dealership after school, on weekends and during the summer months. Later, at the age of 19, Tom went on the sales floor and had a successful year selling cars for his father. He then enrolled at the University of Victoria, spent one year there, and promptly dropped out. At the time, Tom felt his time was better spent selling cars rather than pursuing an education to become a shop teacher. So Tom returned to Nanaimo and again sold cars for his father. Back at the dealership, Tom had the opportunity to work for several unique sales managers and in 1971, at the age of 22, Tom was appointed Sales Manager of Jack Harris Chevrolet Oldsmobile Cadillac by his father. It was a difficult transition for Tom to manage men many years his senior and with 15 years plus experience; soon enough, though, the staff welcomed Tom and they enjoyed many years of success together. In 1982, the dealership fell on hard times due to an economic downturn. Interest rates hit over 20% and people could not afford their car payments. By this time Tom was married to Christine and together they already had four children; Tom was very motivated to make a good living to support his large family. Tom scrambled to raise the money necessary to buy the business from his father before the banks stepped in; unfortunately, his narrow window of opportunity closed about one week too soon. The banks shut down 15 car dealerships across the province that year, including Jack Harris Chevrolet Oldsmobile Cadillac. 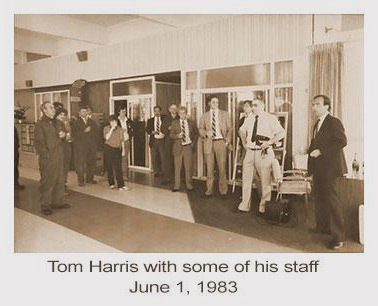 Six months later, on June 3rd 1983, Tom, at the age of 33, opened the doors to Tom Harris Chevrolet Oldsmobile Cadillac Ltd.; this was an entirely new company operating at the same location his dad had for the 15 years prior. Tom’s confidence in himself, his willingness to risk everything, support from his wife, motivation to support his family, and a partner in Jim Gauthier, a very successful GM dealer from Winnipeg, are all to thank for this re-birth. Ten days after opening the new dealership Tom and Christine had their fifth child. From 1983 to 1999, Tom Harris Chevrolet Oldsmobile Cadillac was the only automotive business in what is known today as the Harris Auto Group. At the end of 1999, Woodgrove Chevrolet in Parksville was added; January 1st, 2000 marked the first addition to the Harris Auto Group. By that time, Tom’s son Mike had completed university and had worked successfully in the car industry as a salesperson. Mike attended the National Automotive Dealers Association’s Dealer Candidate Academy. Having successfully completed the intensive dealership operations management program, Mike was installed as Executive Manager of Woodgrove Chevrolet. This dealership is now called Harris Oceanside Chevrolet Buick GMC Ltd. In 2000, seeing the opportunity in smaller imported vehicles, the group added a start-up Kia franchise; at the time Kia offered two models: Sephia and Sportage. Kia was considered to be a speculative automaker at that time. Many felt this was a poor move but ownership felt that, given time, the Kia dealership would become a mainstream franchise. During 2008 and 2009, Tom’s youngest son, Tony, completed the NADA Dealer Candidate Academy and Dealer Executive Education at Babson College. He is now the General Sales Manager of Harris Mazda. Since then the Harris Auto Group has either rebuilt or significantly refreshed all of their dealerships while working on, and re-investing in, the operating companies. On May 12, 2009, Tom Harris Chevrolet Cadillac was sold to the Wheaton organization when it became evident there was simply no longer room in the Nanaimo market for two large General Motors dealerships. Less than a week later, General Motors eliminated nearly half of their dealerships in Canada when they fell on hard economic times; almost certainly one of the two franchises would have been cut. Part of this deal was the acquisition of the Buick and GMC franchise rights, from the Wheaton organization, for the Harris Oceanside Chevrolet dealership in Parksville. In June of 2012, the Harris Auto Group purchased Barrie Brown Nissan, now Harris Nissan North Island, in Campbell River. This was subsequently sold in 2014. In September of 2012, the Harris Auto Group purchased Ensign Chrysler, now Harris Chrysler Dodge Jeep Ram, in Victoria. 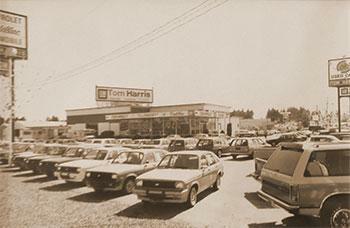 Not only was Tom Harris a car dealer, but also in 1986 he entered the cellular phone business. Tom was originally approached by a Cantel representative attempting to sell him some cellular phones for his business in the hope of gaining enough interest so as to support the erection of Nanaimo’s first cellular tower. Tom immediately saw the potential and enquired into the possibility of being a cellular phone dealer; shortly thereafter Tom began selling phones out of the showroom of Tom Harris Chevrolet Oldsmobile Cadillac, enlisting the service department personnel to install the devices into customer’s vehicles. Soon the business took off and a larger store was required to service the growing customer base. It was then that a cellular phone “store” was opened above the showroom at Tom Harris Chevrolet Oldsmobile Cadillac. Many Nanaimoites recall those early days when they purchased their first cellular phones from “the store above the showroom.” The store ran this way for four years as a Cantel distributor; in 1990 Tom switched to BC Tel Mobility so as to gain a competitive advantage. Ultimately Cantel became Rogers Communications and BC Tel Mobility became Telus Mobility. Over the years, Tom Harris Cellular bought and sold numerous locations, increasing its presence on Vancouver Island, throughout BC and eventually into Alberta. In 2011, Tom Harris Cellular purchased Tac Mobility; during the same year they also sold 17 stores to Telus. Tom Harris Cellular has continued to acquire and open new stores, raising the total number of locations today to 50. Tom Harris Cellular is the largest Telus Authorized Dealer in Canada.